This is the U Page of our A to Z guide to plants -- how to care for them, landscaping with them, and cooking and healing with them. This is another of my tropical favorites. In appearance it seems delicate with its stems topped by slender leaves in a circular pattern, but this is a hardy plant able to grow in sun or shade. Its one requirement is a moist environment or at least one that is not dry. When it finds a comfortable home it will spread maybe more than you'd like. 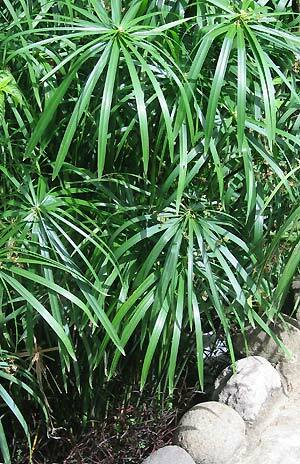 Planting and Care: The umbrella palm will survive in almost any setting, but it will thrive in a sunny or semi shady place with lots of water. 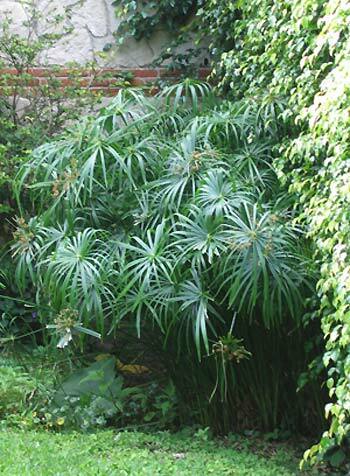 In our garden in Montserrat, this plant has never been more than three feet high. We got the plant from some friends several years ago and theirs was more than four feet high. Go figure! Ours are green and multiplying so they must be happy even though they have become shorter by a foot! I gave a clump of these palms to a friend who planted them in an undrained cement enclosed garden; her palms are now six feet tall!